In this post I'm going to discuss some simple perspectives you can take on pain and movement that can be a shortcut to analyzing a bunch of complicated physiology. But fair warning - this requires analysis of some complicated philosophy by Dan Dennett. Which in my mind is a fair trade. 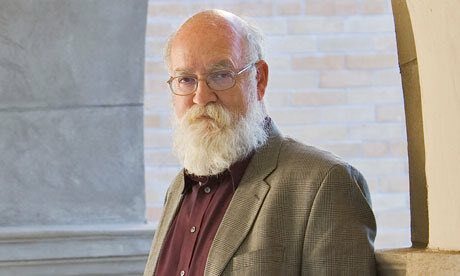 It's no secret I'm a big Dennett fan. He's a very smart guy with an epic beard. One of his many big ideas is that we should use different perspectives or "stances" to understand systems with differing degrees of complexity and intelligence. He describes three levels of analysis: the physical stance, the design stance and the intentional stance. All of them are very common sense ways of thinking, and will seem very familiar once they are described. They are all used extensively in everyday life and science. Of the three, the first one (the physical stance), tends to get the most respect as a legitimately sciencey way of doing things. The second one (the design stance) tends to get viewed with some suspicion, and the third is often considered as being outright fallacious. According to Dennett, each perspective or level of analysis has its own costs and benefits, and is appropriate for different kinds of jobs. I agree, and think that the intentional stance is often underutilized as a very common sense and effective way to understand pain and motor control. Imagine you wanted to predict the result of a very simple event, like releasing a rock from your hand. Using your knowledge about the laws of nature, you would guess that the rock will fall down, not rise up. Dennett calls this thinking process the “physical stance” because it views the object whose behavior is to be predicted as being under control of physical laws. This perspective affords the potential for amazing precision in your predictions. If you have accurate information about the important variables - the angle and velocity of the rock's release, etc, you can determine almost exactly what it will do after leaving your hand. Physicists, chemists and engineers primarily use the physical stance in their work. A lot of what we think of as “science” is applying the physical stance. Now imagine you release a bird from your hand. Applying the physical stance is no longer very practical. Even though the bird is made of physical stuff that must obey the laws of physics and chemistry, there are so many parts to the bird, and they all interact in such complex ways, that using the physical stance is, as a practical matter, impossible. To predict the behavior of the bird, we use the “design stance.” We know that birds are “designed” to fly, so we assume it will act in accordance with this design when released. We use the design stance all the time to predict the behavior of machines. When I press the start button on my coffeemaker, I predict it will start making coffee and not blow up, because my coffee maker was designed to make coffee, and not blow up. At least I assume this is the case, and I could be wrong. Maybe the coffee maker was actually designed by an evil genius, or maybe its design is now broken. To know for sure, I would need to take it apart and apply more of a “physical stance” mode of analysis. But this is impractical. In biology, the design stance is ubiquitous. It involves the recognition that organs have functions and purposes. The heart was “designed” to pump blood; the kidney is a filter; the “purpose” of the lungs is delivery of oxygen to working muscles, so they can do their “job” of contracting to “help” us move. We predict that these organs will in most cases act in accordance with these purposes. For example, when muscles are working hard, we are unsurprised to learn that the lungs will also start taking in more oxygen to “help” them. These ideas about function and purpose and design are essential to a scientific understanding of the body, even though they involve concepts that are somewhat ambiguous, and not subject to precise measurement or proof. What’s the purpose of the appendix? We don’t know. One of the cool things about the design stance is that once you know what something is designed to do, you can make accurate predictions about its behavior without knowing anything at all about its inner workings. I don’t need to understand electronics to guess what a DVD player will do when I insert a DVD. And I don’t need to know exercise physiology to know that my body will probably adapt to get better at withstanding the physical stress of certain kinds exercise - that’s what its designed to do! So the design stance is everywhere in biology, and totally necessary, but it is inherently risky because we can be mistaken in our assumptions about the nature and quality of the design we are analyzing. It is pretty clear that hearts are designed for dealing with the stress of a little running, but what about marathons? Some people would argue that extreme endurance running is bad for the heart because it is not "designed" for that function. Are we “born to run” in bare feet? Experts like Daniel Lieberman say yes, but the jury is still out on whether the natural design is better than the artificial design of running shoes. And even if they are, questions would remain - are bare feet designed to run well on concrete? And do they lose their function after years of being in shoes? The physical stands tends to get favored over the design stance as the most "scientific" way to go about explaining something. It involves objective measurements, precise descriptions, and cool technology like microscopes. At this level of analysis, we can see some very interesting physiological things happen. For example, the microscopic view might reveal that fascia changes in response to force, and vertebral discs sustain micro-trauma and inflammation from repeated movements into flexion. These facts about very small things in the body are very interesting indeed, but it is tough to extrapolate their meaning in the context a larger whole. Do these facts mean that fascia can be melted by a foam roller, or that we should spend as much time as possible keeping our spines in neutral? Evidence gathered from the physical stance seems to support these claims, but the design stance can act as a reality check. One of the functions of fascia is to provide stability to the body, so it would not make much sense if it started to melt every time we sat down on something hard for a few minutes. The back has 24 joints - looks like it was designed for movement! If it's job was to remain straight all the time, it would be probably look like a femur. So the evidence gathered under a microscope is quite interesting, but we need to make sure any conclusions we draw from that also make sense from higher level perspectives as well. The highest level of analysis from which to view a system is what Dennett calls the intentional stance. This offers the most predictive power with the least amount of measurement and computation. But it also introduces the greatest risk of error. It is applied to systems that are intelligent enough to have some degree of agency, intention and rationality. For example, if you met a bear while hiking, and you wanted to predict its next action, you would immediately start trying to guess its intentions - does it want to eat me? Or the sandwich I’m holding? Is it scared of me and wants to run away? Does it want to protect its cubs? If you knew the bear’s beliefs and intentions, you would have a good guess about its next action. This information would be way more useful than any kind of hard physiological data you could measure objectively. But of course your guesses about intention might be wrong. You can use this same strategy to predict the actions of semi-intelligent things that we don't normally think of as having intentions, like machines, bodily organs, or even single cells. Plants don't get that much credit for being very smart, but we can understand them better by assuming they are pursuing goals. They “want” sunlight exposure, so they grow their limbs in the sun’s direction. They don't “like” pests to eat them, so they increase their production of natural pesticides when they “realize” they are being attacked. Even something as dumb as a bone has a certain kind of rationality – it is smart enough to start strengthening itself in areas that receive a lot of compressive shock. If you were a bone and wanted to maintain your structural integrity, that's what you would do too right? The intentional stance is actually a very common sense move that we make all the without even thinking about it. For example, we can't help but assign mental qualities to smart machines like phones or computers. If I was playing chess against a computer and exposed my queen, I would be certain it would take my queen on the next move. Because I know the computer “wants” to win, and can act rationally in pursuit of that goal. It’s behavior is of course ultimately not controlled by “intentions”, but by its programming code. But if would be computationally almost impossible to review all that code and then figure out what the computer will do under this exact circumstance. It’s far easier to simply act “as if” the computer is a smart person. First you decide to treat the object whose behavior is to be predicted as a rational agent; then you figure out what beliefs that agent ought to have, given its place in the world and its purpose. Then you figure out what desires it ought to have, on the same considerations, and finally you predict that this rational agent will act to further its goals in the light of its beliefs. A little practical reasoning from the chosen set of beliefs and desires will in most instances yield a decision about what the agent ought to do; that is what you predict the agent will do. This is the exact same process we use to understand the workings of the most intelligent systems in our body like the nervous system, immune system or the motor control system. They are too complex to understand through brute force measurement of all their parts, so we need to anthropomorphize the wholes: imagine they have intentions and goals, and the intelligence to consider different options for action. We can get further insight by looking at what kind of information they are acting on, and what kind of logic they apply in making decisions. In my opinion, most of the clinically relevant and recent advances in pain science has involved application of the intentional stance to pain. Researchers like Melzack, Gifford and Moseley are asking exactly the kinds of questions suggested by Dennett. For example, to understand pain, the most important question to ask is: What is the purpose of pain? What is its function? What do the systems that create pain intend to do? Although there is no objective way to answer these questions, everyone seems to agree that the purpose of pain is to motivate action to protect the body from physical threats. Once this purpose is clear, we have already made some progress in understanding some pain phenomena that are otherwise difficult to explain. Why is it common in an emergency situation for people to experience major injury and yet have no pain? Because that would not serve pain's "purpose", which is to protect the body, not disable it from protecting itself. Thus, recognizing that pain has an “intention” can help move us beyond the antiquated and physical stance-ish idea that pain is controlled by simple reflexes activated by tissue damage. The next set of important questions about pain are: how does the pain system think? What “beliefs” does it have? What kinds of information does it have access to and how does it process that information? The neuromatrix model is an attempt to answer these exact questions. It identifies the source and the nature of the information that the system uses to form beliefs, and the potential actions it can take on the basis of those beliefs to accomplish its intention. Or consider the excellent book Explain Pain. It discusses the logic of the pain system: how the system thinks, what it wants, what it believes, and the kinds of evidence it uses to make decisions. And, importantly, how the system makes mistakes and those mistakes can be corrected with new information. It's like getting to know a person. How would you convince that person pain is no longer necessary? In answering that question, you have probably just thought of a reasonably good treatment. We can use a similar line of thinking to understand the motor control system. What kinds of information does it need to solve motor problems? Where does this information come from? Which kinds of information are likely to be more valuable given the way the system thinks? What motivates it to learn and adapt? Once again, this perspective has its risks. It is not easy to put yourself into the "mind" of the systems in the body that govern pain and motor control. But trying to do so remains an important part of understanding them.